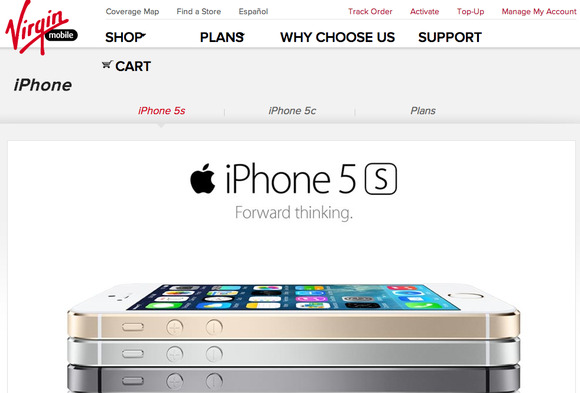 Virgin Mobile will begin selling the iPhone 5c and 5s starting October 1—the earliest the company has ever begun sales during an iPhone’s product cycle. The company made its announcement on Friday, just a week after the phones went on sale at major wireless carriers, and just three months after Virgin began selling the iPhone 5. Similarly, the company didn’t begin offering the iPhone 4 and 4s until June of 2012, just as the 5 was getting ready to market. Virgin Mobile’s earlier arrival during this iPhone generation may signal changes to the pre-paid wireless market. In both of the previous years, the company followed Cricket in offering the phones with pre-paid plans—by just a month in 2012, but by a full nine months for the iPhone 5. So far, Cricket parent company Leap Wireless has been quiet about its plans. Additionally, the iPhone 5c and 5s will also go on sale October 1 for two regional carriers, Mississippi-based C Spire and Wisconsin-based Cellcom. Virgin offers three plans for the iPhone: $35 per month for 300 talk minutes, $45 per month for 1200 talk minutes, and $55 a month for unlimited talk time. All plans come with unlimited messaging and data, and Virgin even drops the monthly price by another $5 if you set up auto-pay. Though Virgin didn’t say Friday how much it will sell the new phones for, the company has sold previous versions at subsidy-free prices—the iPhone 5, for example, still sells for $550 on the Virgin Mobile site.